A recent incident has got me fired up about poor restaurant management practices. A 36-year-old waitress at an Owen Sound, Ont., restaurant lost her job this week after she shaved her head to raise money for a cancer charity. The head Chef/owner’s rather weak excuse for this action is that he has a standard of dress that he expects from his employees. The problem I have with this is that she claims she had told him what she was planning to do well before hand, and nothing was said. Nathaniels owner and chef Dan Hilliard issued a statement late Thursday saying Fearnall did not advise him that she was planning to shave her head. “Mr. Hilliard had indicated that this is an employer-employee matter and such matters are not to be dealt with in the public,” the statement said. Frankly, the waitress was still very presentable with the shaved head. I probably wouldn’t bat an eye if she waited on me in a restaurant. Also, she did it for a good cause. It’s not as if she went out and did it to spite her boss. I fully agree with kitchens with a no piercing policy, etc, where health code issues are cited as the reason. However, I’ve worked in the food and hospitality industry for years with a shaved head, and never had a problem. How about some equality? This story honestly sounds like something I’ve come across many times in different kitchens. An owner who has poor management skills and may be a little mentally unstable begins to treat employees like he owns them. It’s crap and I don’t like it. Why should an employee be punished for doing a good deed? China, originally uploaded by adelphos24. That picture was taken at the International food and wine festival at the epcot center a few years ago. Only a true food geek would admit that he was on his honeymoon. We didn’t go to Disney World for our honeymoon specifically for the festival, it was more of an added bonus. It turned out to be one of the highlights of the trip. 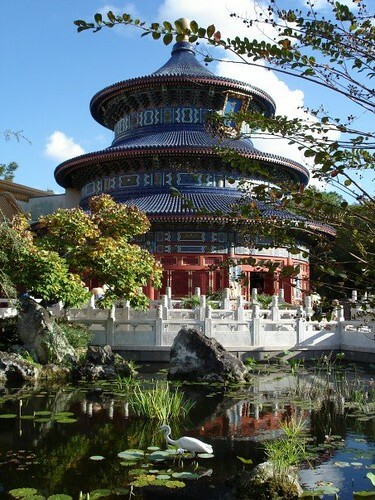 The entire festival took place at the epcot center, around the world showcase exhibits. Several stalls were set up offering a small sampling of food from different countries for a reasonable price (The Disney theme parks can be very expensive when it comes to meals). There were also demonstrations throughout the week, but we were too busy acting like kids to catch many of these. One of the more memorable moments happened our first night. We had just left the Japan exhibit, tyco drums still pounding, and as we came around a corner, ran into a group of people doing the twist. After my initial confusion, I realized that we had inadvertantly walked into the middle of a Chubby Checker concert. For those of you old enough to know who Chubby Checker is, yes he’s getting up there, but he can still dance. For those of you who don’t know who he is, thanks for making me feel like I’m getting up there, but I can still dance. For anyone planning a trip to Disney World, I highly recommend going during the food and wine festival, if for no other reason than to keep food costs down during your trip. http://stuffwhitepeoplelike.wordpress.com/ -the twist is definitly something white people like. http://disneyworld.disney.go.com/wdw/index?bhcp=1 – for anyone looking for a fun vacation. http://www.chubbychecker.com/ – the man, the legend.